Do you put off praying because the location, timing, and even your focus seems off? Do you compare or try to measure up to how other people spend time in prayer? I think a lot of us have a vision of how our prayer time should unfold. We have a rough mental list of expectations and when we can’t meet them, prayer time gets sacrificed. We’ll try again later when our schedule, emotional state, or well … life gets better. You wake early as the sun peaks through the curtains. Dressed with a smile every bit worthy of Psalm 118:24, you peel back the covers and make your way to your favorite overstuffed armchair near a large window (no need to stop off at the bathroom, God took care of that little necessity to maximize your time together). As you peek outside, still rejoicing in the day the Lord has made, you’re rewarded with blooming flowers, singing birds, and gentle breezes that dance on the leaves of tall trees. Inside, on a small wooden table, is a well-worn Bible and an old leather journal. A cup of piping hot tea (obviously made by the Holy Spirit) sits next to a vase overflowing with pink hydrangeas. Here, you spend the next uninterrupted hour in focused prayer. Praising, asking, and waiting to hear the still, small voice of God. Clarity is your robe, and wisdom flows onto the pages of your almost full journal. Yes, this is prayer. This is the place where prayers are spoken, and more importantly, where they’re answered. Holy work gets done here. And if you can’t make this vision happen, you might as well not even bother with prayer at all. Not exactly reality, is it? Yet, I bet many of you have a similar scene. And the more we try to stuff our reality into this fantasy, the more we put off prayer, and miss out on growing the most important relationship we have. Our prayer life needs a reality check. Most mornings, I don’t rejoice when the sun comes up because it means another night of lost sleep. There’s no time for Holy Spirit hot tea when lunches need making, and sleepy teenagers drag their feet. And I hardly remember to pray unless you count that time last week when I shouted “Jesus” when I was almost sideswiped by a driver who decided to go off-roading just to get ahead of me in heavy traffic. No, my reality looks nothing like my ideal vision of prayer. How about yours, does your reality match up? I think it’s time we let go of our fantasy and embrace the reality of prayer. Prayer isn’t about a mood or a method. It’s not about a ritual or a routine. It’s about necessity, want, and hope. Other Bible versions use words like lonely, deserted, solitary, isolated, and wilderness. These words paint a very different picture about the ideal vision of prayer. Maybe our desolate place is under a mountain of unpaid bills, or lonely is the bed we share – or shared, with a spouse. Deserted looks like friends who used to call, and wilderness feels like every minute of every day. 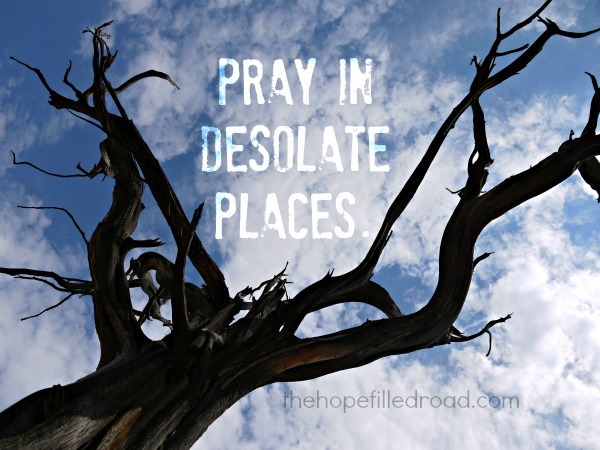 Jesus often went away to desolate and isolated places to pray and be with God. Lonely places were he could focus on his Father. Honestly, we carry our solitary wilderness around with us all the time. There’s rarely a time when we escape it. Yet we put off prayer. Waiting until conditions are right, or time opens up. And every time we sacrifice prayer – because our reality, and perfect prayer time do not match up, we move further away from God’s peace, forgiveness, and freedom. Let’s put our fantasy prayer time where it belongs – in the grit, muck, and mire of our common, crazy life, and in the midst of every messy, wild moment. Jesus sought out such places. I’m pretty sure he’ll go there with us, too. I encourage you friends, to invite him into your reality today. Sweet Raye! Thank you for my ideal of a perfect prayer setting: especially the Holy Spirit tea!! We realize it’s just an illusion; however, I can find that serene idyllic setting in my mind no matter where I am or whatever the circumstances. You’re welcome, have a beautiful day! Wow Raye that is something. Was just thinking about that on Saturday. I have always told myself that I need to make myself a special place to go to so I can pray quietly. Then here I read your Hope Filled Road and I am reminded that it doesn’t matter were I am that He listens. That I don’t need any specific place. That He is happy just to hear us pray. Thank u for sharing with us today. Have a blessed day. Thank you Lori, so glad to liked it. You have a blessed day too!